Obituary – Thompson, Leora Fay « Perry High School Alumni Association, Inc.
President Club Espanol, Athenian ’20, Football ’19. Leora Fay Thompson, 52, Perry rural mail carrier for 39 years died at 6:30 p.m. Friday in Perry Memorial hospital following an illness of several months. Funeral will be at 2 p.m. Tuesday in the First Methodist church with Rev. Oscar Fontaine, pastor, officiating. Burial will be in Grace Hill cemetery under direction of the Parker funeral home. Thompson was admitted to Memorial hospital Friday afternoon. Born Sept. 10. 1896, in Oswego, Kan., he was married here in 1928 to the former Marie Leighan, who survives. 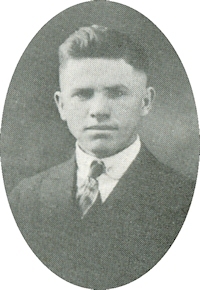 He came to Noble County in 1915. Thompson received a permanent appointment as rural mail carrier Jan. 2. 1919, and had served the same Noble county area south of Perry for 39 years. He covered route 2, Perry. A member and former steward of the First Methodist church, he also had been an active member of the Knights of Pythias. He had served as chancellor of the KP’s and was a member of the Masonic lodge. The Thompsons had lived on a farm northwest of Perry since 1931. Survivors other than his wife of the home are three daughters. Mrs. M. M. Schreiber. Pacoima, Calif: Mrs. Tommy Eppler. Rayne, La. : and Mrs. Anthony Orlando. Chicago: three sisters. Mrs. Elda Clayton, Council Bluffs. Iowa: Mrs. Gertrude Rugh, Costa Mesa. Calif. and Mrs. John Sparkman Poway, Calif; three brothers, Roy Thompson, Hawthorne. Calif.: Ronald Thompson, Colton, Calif., and Kenneth Thompson. Perry: and four grand children.